Considering the time saved for stage setup, the added sturdiness and quality of materials, plus the added benefit of the Auto GripTM system makes the Hercules guitar stands a tough act to follow. As a musician I've gone through my share of guitar stands As I own quite a few odd shaped guitars, I've always had trouble finding a stand that would fit right. The balance of most stands was also something of a black art that I've never been able to master. I also never quite got around the locking rubber mechanism or swivel bottom as they usually broke or fell off during transit. As far as stands are concerned, I honestly didn't think something new and innovative could come to the market – after all a stand is a stand. It turns out I was very wrong – just as in Greek mythology, Hercules manages to challenge the status quo. The stands in this review are the Hercules GS412B and GS414B. They currently sell at $47.95 and $34.99 respectively (street price). They are similar in appearance and function, so unless specifically mentioned, features should apply to both. The GS412B and GS414B both feature Hercules' patented Auto Grip SystemTM yoke and Comfort GripTM systems. Both stands are unusual as they don't have the swivel bottom that we've grown accustomed to. The guitars hang straight down instead. In the case of the GS412B, a folding backrest coated in specially formulated foam supports the guitar from the back. On the GS414B, the guitar rests on the legs of the stand, which in this case are coated with the same foam. From the get go, it became apparent that Hercules uses better quality materials than the regular run of the mill guitar stand. The metal frames are sturdier and have a more confident feel to them. The Auto GripTM is an amazing innovation that automatically locks the guitar when it is placed on the stand. Lifting it up automatically unlocks and releases the instrument, which makes it ultra fast for switching stage guitars. This feature alone probably would sell the stand as all my guitarist friends were impressed by its effectiveness. Both stands are quite rugged and can hold a variety of guitars. The GS412B is perfect for the usual strat shapes, Flying Vs and odd shapes like Jackson Kelly or an Explorer. The GS414B would be a little more limited as the legs of the stand are actually the support. This stand works well with all shapes described above but for Flying Vs, which felt better secured on the GS412B. There is no direct competition for the GS412B, but the Ultimate Support GS-100 ($29.99 street) comes close in function to the GS414B but lacks the Auto GripTM system. When comparing the two, for $5 extra the Hercules is definitely the winner as it has better security, is easier to adjust and it is better balanced on the ground due to its slightly larger metal tubes and weight. 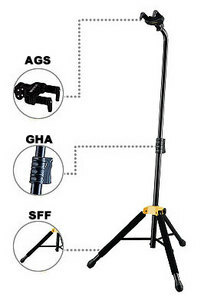 Gigging with these stands is a breeze, they are sturdy, comfortable and quick to adjust. 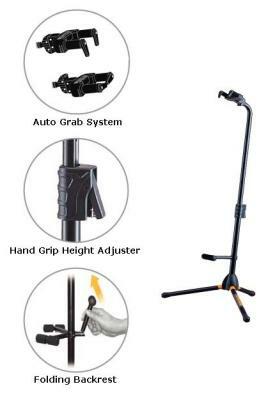 Considering the time saved for stage setup, the added sturdiness and quality of materials, plus the added benefit of the Auto GripTM system makes the Hercules guitar stands a tough act to follow.